The BBC World website is reporting that Thom Yorke, the singer from Radiohead, has pulled some of his music off Spotify and Rdio because he says that their royalty payments are too low. Radiohead are not new to this type of provocation however. In 2007 they released an album “In Rainbow” that could be downloaded only from their website. The interesting line was that the listener could pay whatever they wanted for the download, there was no fixed price. They came in for a lot of criticism as this article in the NME shows, with some people claiming they were making it more difficult for new bands to make any money from their releases. Well Thom does not agree. The album was “bought’ 3 million times in its first year of release and Yorke himself says that the band made more money from this one album than all of the others put together. 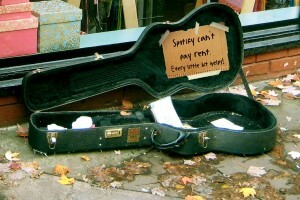 So this leads to the obvious question about Spotify, how much do they pay? As a musician myself I have a good knowledge of how the payment systems worked in the days before digital downloads. When my band released albums or singles and we received radio play we were paid. In the UK about 15 years ago an artist was paid about $30 a minute for a play on national radio. This means about $90 to $100 for a song, minus the 20% that the PRS take for collecting it and distribution. It’s good money. One single that gets 10 plays on John Peel or other fringe shows could make $1000, enough to make another. Now Spotify is different of course because a play is personal, not to an entire country. This article on the Music Think Tank blog explains how royalties are worked out, but I will try to explain here as simply as I can. Spotify make money from advertising and subscriptions. They pay 70% of their income out in royalties for the music they play. They pay out pro-rata, so if 1% of all streams happen to be your music, you get 1% of that total payment. Simple enough (maybe). So lets look at the numbers. In 2011 Spotify generated $20,333,333 per month. They distributed 70% which is $14,233,333. They had 1,083,333,333.333333 streams per month. Let’s say I got 20 streams a month, about 0.00000184615% of the total royalties payout. I make $0.26 a month, that is 26 cents. $0.01 per stream, minus the 15% that the digital distribution company takes for putting the tracks up and the 10.2% publishing fee. About a quarter of a cent per play, in round terms, anyway not a lot of money by anyone’s standards. Of course the more people use Spotify, the less an individual stream is worth. In the US Pandora, another streaming site is pushing Congress into passing legislation that will cut this rate further, by 85%. Even Pink Floyd have been complaining that artists are being duped. I for one keep making music and releasing it to the world, I don’t expect to get rich though! UPDATE: This week the BBC has a follow up article about Thom and Spotify. Check it out here. UPDATE: Spotify has now revealed it pays artists $0.007 per stream. That’s a lot less that previously thought. Then again, if you are riding high in the global charts and get 5,000,000 streams (which I am sure is perfectly viable) then you could be looking at a $65,692.31 payout a month. After tax and agents fees that probably isn’t very much though I suppose. Would it be better if Spotify only paid the top 100 artists? How about all those not in the top 1,000? Which is more fair? The long tail is likely to be quite big though – i.e. the number of artists below the 1,000 mark. All I can say in Spotify’s favour is, at least it doesn’t take a 50% share. Many firms take a much bigger share (like Amazon with your book) and some refuse to declare percentages at all (like Google with [most of their] AdSense products). In the music industry it is always the top artists that get paid. Their data is the easiest to trace and manage. If you only get a few plays then you don’t get anything anyway, as there is a minimum payment in most systems, and the money that is left unpaid is divided on the basis of how much the artist earns, so I get nothing but Sting gets part of my unpaid royalty (but not as much as Noel). Turns out not even the top artists are really getting paid. See the BBC News article linked in the update above; $0.007 per stream.